The title ‘hero’ has become such a popular buzzword that it has almost lost its meaning. Some people, however, are undeniably heroes. World War II veteran Ray Lambert is one of them. Although most of us will never be heroes or heroines in the same way as Ray, leaders can draw important lessons from his example on how to make a difference. Being a hero isn’t just doing one’s job, even if that job is extremely dangerous. American soldiers in combat put themselves at risk all the time. And while the overwhelming majority perform to a high standard, they might not be heroes. What distinguishes true heroes is their willingness to put themselves at extraordinary risk to advance the common good; to change a situation that is unacceptable. Such risk must be undertaken voluntarily. Valor medals recognize these distinctions. They are reserved only for those who demonstrated bravery above and beyond the call of duty. 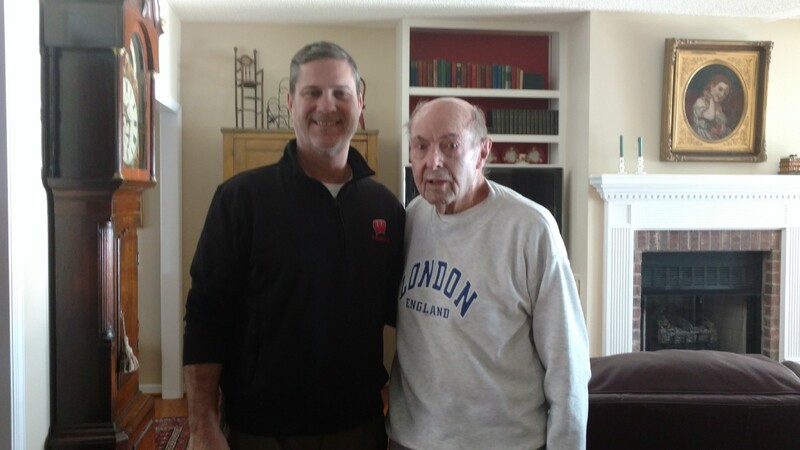 Ray Lambert, 97-years strong, is a real hero. Ray grew up in depression-era northern Alabama. He left home and school at age 13 to get a job. His father had broken his hip, so Ray needed to live on his own for a while. He worked several odd-jobs for a few years. He and his older brother Bill got fed up with the lack of opportunities and joined the Army in 1940. He became a medic and joined the 1st Infantry Division. He married Estelle in 1941, shortly before deploying overseas. Now a Staff Sergeant, Ray was in charge of the medical section for his battalion. He was in the first wave (the lead attack) of Operation Torch, the invasion of North Africa in November 1942. There, he was awarded the Silver Star for charging into a minefield to rescue a wounded soldier. He also pulled two crew-members out of a burning tank just minutes before it exploded. He was putting himself at extreme risk to save others — to change unacceptable situations. Ray was also in the first wave as the allies invaded Sicily. The July 1943 landing at Gela was hotly contested. He treated hundreds of wounded soldiers in the intense month-long campaign as the 1st Division attacked through the island’s mountainous spine in the toughest fighting of the campaign. He was awarded another Silver Star for, again, going into a minefield to rescue a wounded trooper. By this time, Ray also had three Purple Hearts (a medal awarded to those wounded by enemy action). On June 6, 1944, Ray was yet again in the first wave. He jokingly notes he was “lucky” that way. This time he was at Omaha Beach. Hundreds of his comrades were struck down as they tried to wade ashore. Ray ran back and forth from the beach into the surf countless times to rescue drowning and wounded soldiers. Dodging bullets and shrapnel and bombs all the way. It was unacceptable to Ray that soldiers should die on that beach while he had the strength to save them. He set up a casualty collection point behind a chunk of concrete the Germans had left on the beach. “It was the only cover on the whole beach,” he explained. Ray put one of his medics, Private First Class Lepore, at the rock to the treat casualties Ray brought to him. Moments later, Ray was shot by a German bullet. Blood trickled down from the wound near his elbow. That one “just pissed me off,” he said. He patched himself up and drove on. As a medic, he knew just what to do. He self-applied a tourniquet, bandaged the wound, and took a shot of morphine. And still he drove on, rescuing and treating more soldiers — actions that were well above and beyond the call of duty. Ray raced back into the surf a final time to rescue yet another drowning soldier. Just then, a Higgins boat (assault landing craft) carrying soldiers in the next wave pulled up behind him. The boat dropped its ramp, slamming into Ray’s back and pushing him and the other soldier under water. The ramp crushed two vertebrae. Ray believed he would drown. “What a way to go,” he thought. Lungs burning from lack of oxygen, Ray managed to get free. Twice wounded, a tourniquet on his leg, and now a broken back, Ray was moving forward on adrenaline. He got the drowning soldier to that hunk of concrete and told him to join the attack. At that point, Ray looked at Lepore — he simply couldn’t move anymore. They would need to trade places. Lepore stood up from behind the rock. He was immediately shot dead by a sniper and fell on top of Ray. Ray passed out from pain and loss of blood. He woke up on a hospital ship hours later. In the bed next to him, badly wounded, was his brother Bill. He was hit about 200 yards from where Ray was struck. Bill lived to be 95. Ray convalesced in a hospital in Florida until he was well enough to be released. That was 1945. With $275 dollars in his pocket, Estelle, a 4-year-old son he had met for the first time upon his return to the States, and a “thank you for your service,” Ray was discharged to build a new life. He moved to Massachusetts where his brother was living. He worked odd jobs to provide for his family while he learned an electrical trade. Ray never finished High School. He battled post-traumatic stress. He learned that talking about his experiences helped. He built an electrical repair company. It thrived. He sold that and built another company, which grew even larger. At the same time, Ray volunteered for many civic organizations. He wanted to make his community a better place. He still visits 1st Division units, talking to medics about his experiences and learning about theirs. Ray is a real hero. A valiant combat leader, highly successful business leader, and a community leader, Ray has lived a life of impactful service to his country and fellow citizens. He exemplifies the Greatest Generation. Few people are thrust into the life and death, high risk situations that lead them to be heroes like Ray. We should be thankful for that. Nonetheless, we can all make a difference — we can make an impact on others and on our community; we can change an unacceptable status quo. 1. Set the example. Be trustworthy in competence and character. Treat people with respect. Share the hardships. Do not ask others to do what you are too afraid to do yourself. Take the blame and give the credit. Be able to disagree without being disagreeable. Never throw your people under the bus. 2. Pay it forward. Advance the common good. Be a mentor and role model. Volunteer. Make a habit of making a difference in the lives of others. 3. Take a stand. Evil triumphs, said Edmund Burke, when good people look the other way. Take a stand for basics like common decency, respect, and fair treatment. We create a new standard of acceptability each time we let jerks, bigots, and the like go unchallenged. Take a stand in ways that invite cooperation. The so-called little things make a big difference. 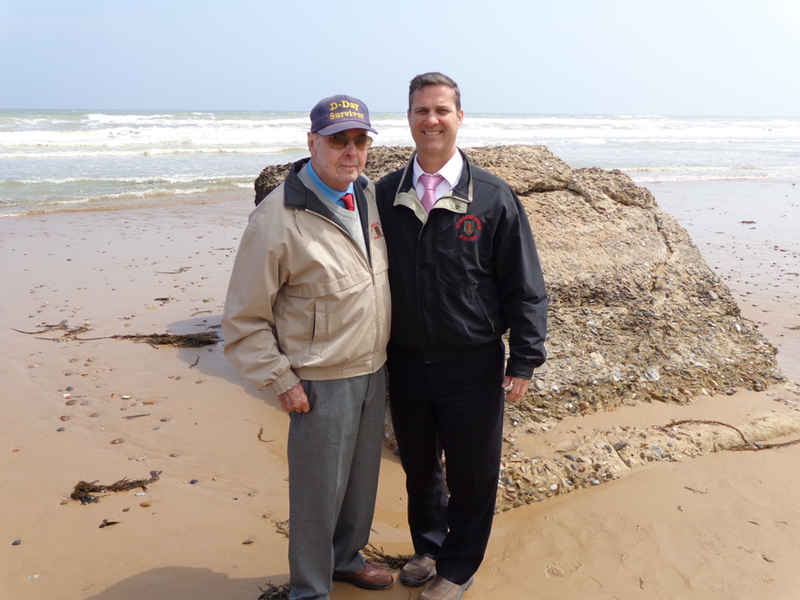 I met Ray for the first time in 2004 at Normandy during the 60th anniversary of D-Day. We have been dear friends ever since. Ray still hears the voices of his comrades in the waves. Christopher D. Kolenda, a combat veteran, is founder of the Strategic Leaders Academy — inspiring nonprofit and small business leaders to maximize their impact. Chris@strategicleadersacademy.com.